the set is lovely and was (I am told) easy to put together. 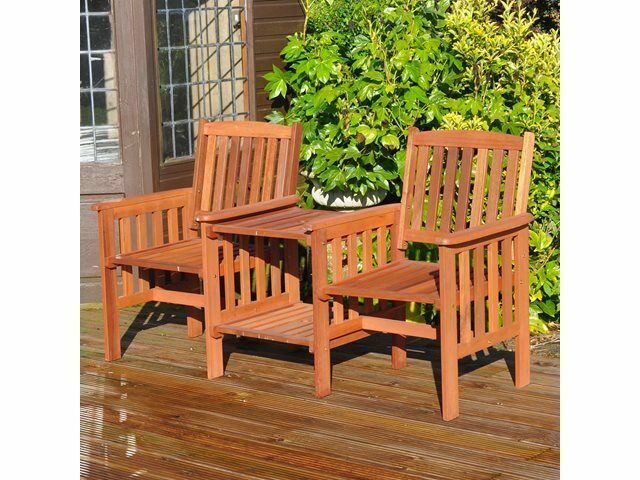 I used teak oil to protect it using the oil 3 times in all and will oil it again every 6 months. It looks lovely in the garden with it's handy little table for a plant and a cuppa or a glass of wine. The price was very good too and delivery was fast. Arrived well packed .very easy to assemble took about 20 mins although I used an Allen key bit in a drill set on a medium torque now assembled looks great and sturdy good value for the price very pleased. Excellent value for a solid hardwood seat. Not difficult to assemble, but there are a lot of screws requiring a lot of turns each. Used a driver with an Allen key head. Arrived on time and appears to be of a decent quality. Good product just what we required for the garden. Even though the wood was treated I have applied a coat of hatch varnish which apart from improving the appearance also protects it against the weather. Very pleased with would definitely recommend it.